Protected: How to Use Pachube with Max/MSP, Processing, etc. It 2008 Haque made released a framework that set up a way to “handle real-time data from sensors in interactive environments for his design practice.” This is another piece of the crowdsourcing movement, and the ability to track this much data and run it through this Pachube hub is very awesome. I guess in July 2011, LogMeIn acquired Pachube. Anyway, Pachube used to be a paid service, but they recently (this month) made the service completely free for all users. An Overview of the Pachube API Documentation gives you a sense of how things work. There is also an API Quickstart that is useful if you know curl or hurl, command-line communication for scraping and posting data. 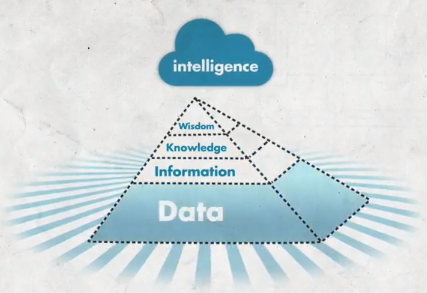 The Health Graph is "a digital map of your personal health." Through Runkeeper.com, the user "gains exposure to millions of passionate fitness enthusiasts" and developers can "build more intelligent social health and fitness apps, websites and connected devices". Changes to your body measurements over time – a ‘like’ relationship doesn’t include a time factor. 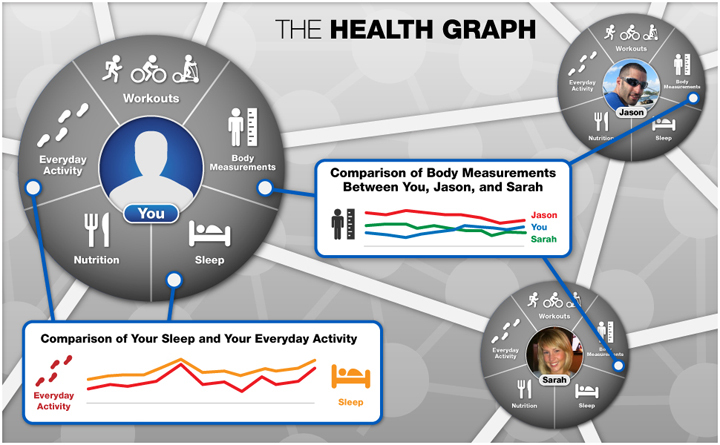 The impact of your activities, sleep patterns and nutrition on your health and body measurements. An analysis of the elements of your social graph that will help motivate you to reach your fitness goals. Identifiy periods of weight loss in your fitness history. Establish correlations between weight loss & nutrition, sleep, activity performance, social motivation, etc. 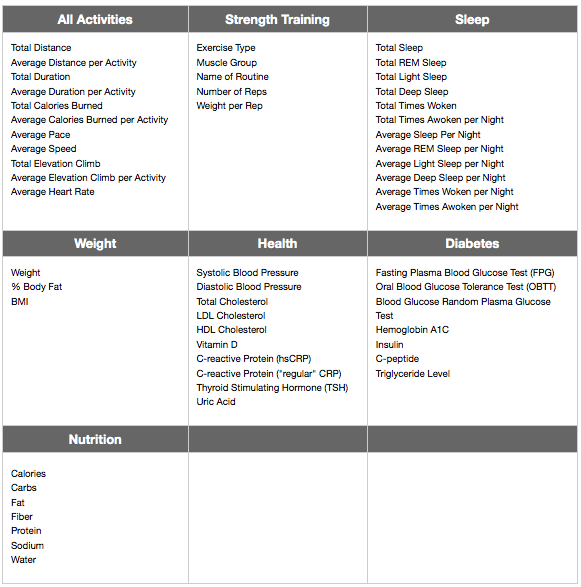 Visually display the relationship between these health data points. Runkeeper claims to have over 6 MILLION USERS, so this seems like it could be a great example of philanthropic Crowdsourcing. With so much data available for analysis, there will inevitably be some interesting correlations, discoveries, and the ability to refine the program. Having access to all of this data would indeed be very interesting for visualization and a “Crowdsourced” Interactive Art Piece. I’ve registered and authorized a Test App at both the Runkeeper Developer Health Graph API site, as well as at the FitBit API Developer Site. I’m learning about OAuth ( 1.0 is used by FitBit & 2.0 is used by HealthGraph). Today I begin with the Beginner’s Guide to OAuth. I think the best way to complete a “Demo” for others to use this data will actually be to develop an web-based app myself that is reverse engineered from the Simple Client Example.I may be able to feed this data into Pachube and access it for use in Max/MSP that way with the MaxPatch that is available from the Pachube forums. Another way that I am exploring is to use QDot’s (NonPolynomial Labs) LibFitBit. I’m starting with this page to make sense of it all… do I need to learn Python for this? 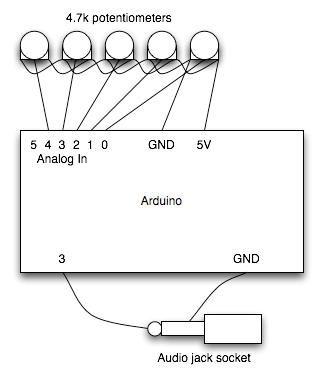 So this project involves an Arduino,, Wii Nunchuck breakout piece and 2 servos…. (From HERE): You can send multiple values from the Arduino board to the computer using the serial print function. In this project, the analog values from three potentiometers are used to set the red, green, and blue values of the background color of a Processing sketch running on the computer. Connect three potentiometers to power, ground and analog pins 0-2. Use the Arduino and Processing codes “Virtual Color Mixer” Files available HERE. This will give you a chance to prototype it…. BUT if you want to actually build it with an Arduino, you can also use it with Max 5 or 6, and the Tutorial for that (with code included) is very useful. It’s so simple but so delicious. Let’s make one… NOW! Any analog sensor can control it, Heat, Sound, Wind, Brainwaves, Light, Skin Conductance, motion, etc. etc. etc.